I’ve enrolled to an excellent Coursera course on video games and learning. This subject is so hot for me and I believe new generations will use games as major part of their blended learning experience. Constance Steinkuehler and Kurt Squire are doing everything to give as a great learning experience. I stole this diagram from the course (Kurt Squire). It shows clearly where social context has a role. Newbies or intermediate players are in my experience not the core of these groups. 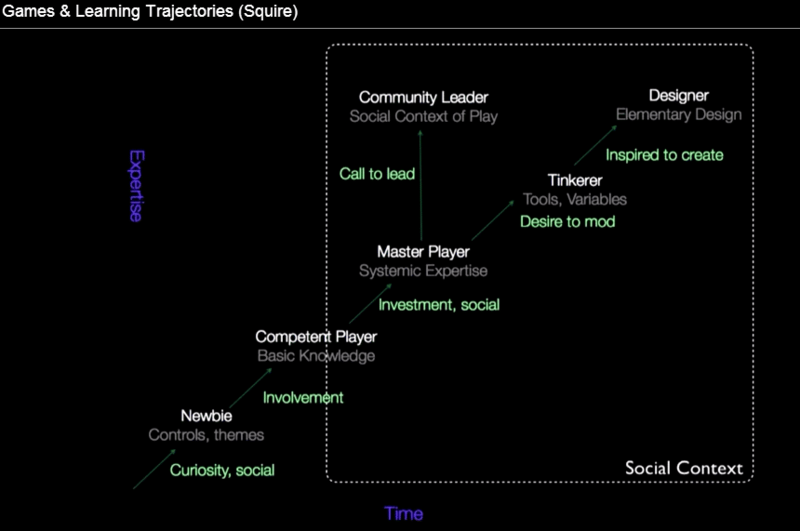 It starts by master players and it continues to designers or game community leaders. I consider these forms of education as valid as any classroom education and I really appreciate the effort for putting all this together.